The rechargeable 16-LED flare features nine (9) different flash patterns (including S.O.S. Rescue Morse Code) that are visible up to 1/2 mile. This compact light emits 360° of ultra-bright light and is constructed of crushproof polycarbonate plastic with an impact-resistant, rubber housing and can resist extreme temperatures. The waterproof flare features a strong magnet that easily attaches to any magnetic metal surface or floats on water. The rugged storage case also doubles as a charging base. 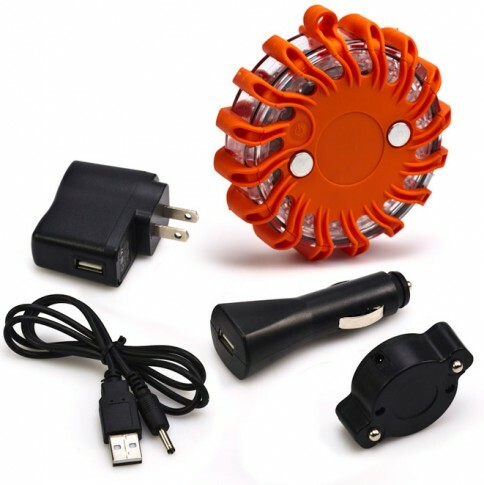 The kit includes 1 flare, storage/charging case, 120V wall charger, and 12V car charger. NFPA, DOT, and MUTCD compliant. Optional in a variety of 5 colors. Optional add-on is the 5.0 Watt Solar Panel to charge the unit in remote locations so that you never run out of power. -Magnetically attaches to cars, trucks, diving tanks, fences…etc. -Enables your vehicle to be seen. -Great for Police, Rescue, Road Service Vehicles, etc. -A viable replacement for road flares. -Perfect for boats and watercraft safety. -9 different light flashing patterns.